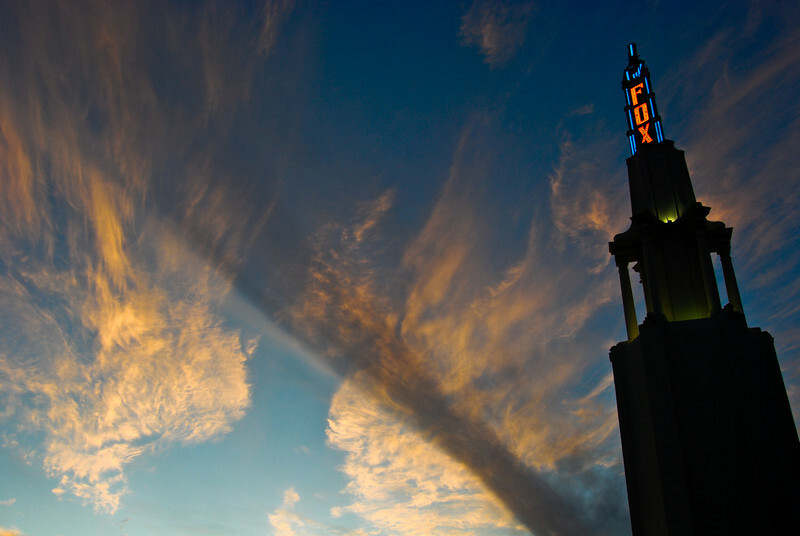 This is the Fox Theater in Westwood, where many movie premiers happen. The clouds were gorgeous yesterday, so I stuck around until sunset and looked for something interesting to photograph them with. There actually was a movie premier going on, too: Marley and Me. It looks terrible, but I guess the dog on the movie posters is cute. This was taken just before sunset, and then the colors started to fade, so I walked away. Then, about 10 minutes later, it lit up again - bright pink. I took a few shots, but my interesting building was way behind me, so they weren't very interesting by themselves. This was my favorite, because it shows a variety of clouds and the detail in them. Well composed shot! Love the color you captured in the sky and on the sign. Cool perspective and beautiful sky! Neat shot, great detail and nice tones. Love the neon sign, great colors, and composition!